The land that West Chester now encompasses probably was an active area for the Native Americans of the region, as it is only second to Ross County in the number of original Indian mounds discovered. The earliest settler to come to the West Chester area was Joseph McMaken, who came from Pennsylvania and applied for land in 1791. The nationality of many early inhabitants was German. Many others were Irish and English. Some of the pioneers were merchants, blacksmiths, tanners, and millers. Some were transporters of goods, others were teachers or ministers. Most were farmers, however, who were attracted to the quality of land. They had no money to buy land and simply took over unoccupied areas. By 1805, the population was increasing rapidly. Transportation was becoming a problem because there were no roads, only trails. Mail was delivered once a week on horseback. The first schoolhouse was built around this time. 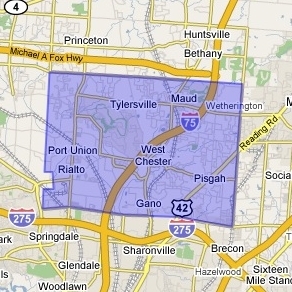 In 1810, the West Chester area was named Liberty Township, as one of the 5 original townships of Butler County. Then in 1823, Liberty Township was divided, and the area that is now West Chester was known as Union Township, encompassing 35 square miles. But the area was commonly referred to as West Chester Township, and in 2000, the name was officially changed to reflect that. In the 1830s the Miami and Erie Canal came through, which improved transportation and development. Railroads soon became the preferred method of travel over the canals, and West Chester had a stop on the railroad, which encouraged business development around the station. Commerce development is a focus of the area, and it has contributed to the population boom that has occurred here since the 1980s.